-Starting a blog? Here’s the Number One Tip. -Top 10 Things I Wish I Knew When I Started Blogging, a must read for beginner bloggers. -These Top Tips for Blogging Success will help you take your blog to the next level. -Here’s 10 Blog Layout Tips to digest before redesigning your blog. -Bethany shares why it’s important to Create a Style Guide for your Blog. -Understand blog design and learn how to work with a designer in this post. -Learn how to Create an Image Map, this one took me forever to learn! -Add a Pin It hover button on your images for easy pinning. -Regardless of what camera you have, these 5 Photography Tips for Bloggers will help you improve your photography. -These 5 Photography Tips will improve your blog photography by leaps and bounds. -Create Quality Blog Photos for your posts by utilizing these tricks. -Super simple tips for staging your photos. -Learn the Do’s & Don’ts of Social Media from Lauren Conrad. -How to Use Social Media for your Blog, great tips from Design Love Fest. -Avoid sounding like an advertisement and use Natural Social Media Marketing. -What is SEO? Find out here, plus tricks on how to use it! -Don’t know where to begin? How about here: SEO Basics for Bloggers. -Try these Simple SEO Tricks for bloggers. -How to Increase Traffic to Your Blog through SEO and social media. -Discover the SEO of Pinterest to increase traffic through your pins. -Learn how to manage your ads with Passionfruit, such an awesome sponsorship resource. -How to Write a Media Kit that Rocks. -Master the art of advertising and make your Blog Sponsorships Successful. -The Secret to a Gazillion Post Ideas, seriously. -In a rut? Here’s 30 Blog Post suggestions. -Go big and print off this huge Monthly Calendar. -Learn how to Organize and Plan Blog Posts in five easy steps. -Keep your inbox clean, 5 Tips for Managing and Organizing Emails. -This Printable Monthly Calendar from Emily Ley are perfect for plotting out posts. -Running behind? Here’s 12 Time Management Tips for Bloggers. -The Blog Life E-course, from my favorite ladies at A Beautiful Mess, is worth every penny. -Learn how to create Blogging Collages on Photoshop and take other classes through Skillshare. -Atly offers a variety of classes geared towards bloggers, like the DIY Bloggers Handbook. -Joy Cho, from Oh Joy, spills her secrets in her book Blog, Inc.
-Learn design, fonts, and color basics for blogging in Blog Design Love 2.0 e-course. Feeling inspired? Ready to spruce up your blogging skills? Today’s your lucky day! 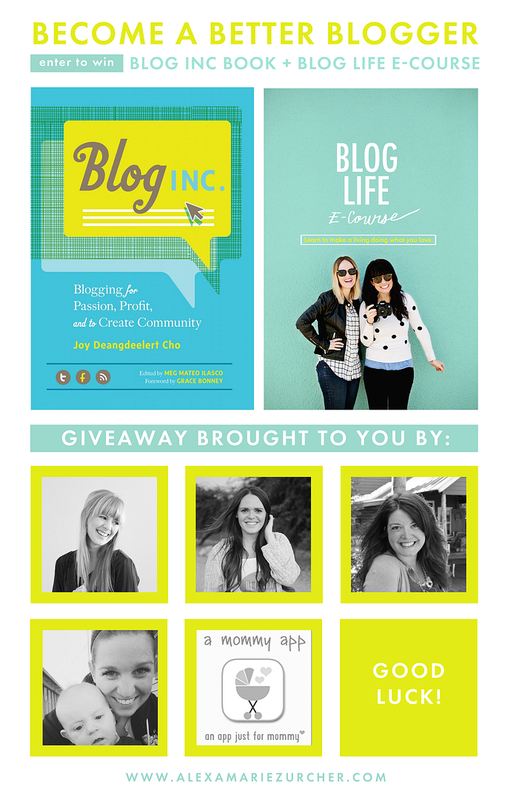 These lovely ladies and I have teamed up to offer you a chance to win two of the best blogging resources out there! Joy Cho’s Blog, Inc book is incredible, and the Blog Life E-course from the ladies at A Beautiful Mess is beyond amazing. You can enter the giveaway below. Giveaway ends on October 30 at midnight. All entries will be verified. Good luck!! This is a fabulous post for anybody considering starting a blog! Great job! I've been looking into purchasing the Blog, Inc. book for a while now but to win one would be fabulous! This is an amazingly detailed resource list, thank you for sharing! Great helpful tips and a great giveaway! Fabulous giveaway! Thanks for all of the links, too! Definitely will be referencing this list in the future! I love this! Seriously, even though I have been blogging for a while now, I love going over material and learning new things or refreshing on things. Thank you for putting this list together, has some of my favorite links in it! Wat a lovely article! I think you're helping heaps of bloggers with this, including me! So many great links in this post. Love seeing all the wonderful ideas out there. Thanks for sharing! Oh my gosh. I have so many post-its with notes on it right now, its ridiculous! What a great giveaway I have Oh Joy's Blogging Inc. and I couldn't recommend it more highly. I have really loved all the blogging tips lately. And this post was just what I needed to read as I switch up a few things up on SoFestive.com. Thanks for all the effort you put into your blog. I love reading it each morning! I've been blogging for nearly 3 years, but I'm still missing something. Not quite sure what, but I'm sure this giveaway could help me find out! So many helpful reads! Thank you for sharing! This post is amazing! So much fabulous content!! Thank you for sharing. Thank you so much for featuring my blog post! What a great resource you have gathered here, definitely pinning this for later! Excited about the giveaway. Also? Your blog is pretty. Thank you so much for sharing a few of my posts here! I'm so thrilled you though your readers might find them helpful! I also currently have a series on the blog about how to make the most of your social media that might be helpful too. You have gathered some really great resources here!